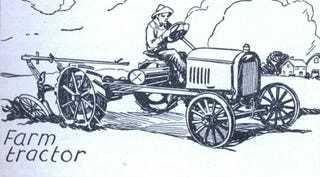 Here's a fascinating article from the November 1928 edition of Modern Mechanics suggesting ways to reuse that old Ford Model T now that you've moved up to a fancy-pants new Model A. Instead of dumping the Lizzie in a back country woods somewhere or letting it rust behind your house, why not reuse the engine as a powerplant for a sawmill or a central vacuum cleaner? Perhaps as a boat motor or an airplane engine? Okay, maybe that airplane engine is a bit far fetched. But using the whole chassis in your house washing business or converting it to a home-built tractor? Sounds good to us! Reading through the article makes us wonder how many of the 15 million Model T's ended up as one of these contraptions — or something even more bizarre.